PLUMBING HOME INSPECTIONS In Bradford and Barrie, ON. There are many components to a plumbing system that require careful attention during an inspection to make sure your plumbing is trouble-free and ready to last for years to come. Cold showers, backed up toilets and flooded floors aren’t anyone’s favorite things, but a complete home inspection of your plumbing can provide a peace of mind that lasts for years. And if you’re in the middle of the home-buying process, knowing any potential plumbing problems before the closing will help you negotiate the best deal possible. Whether you’re buying a new home or simply wanting to head off problems in your own house before they begin, getting a home plumbing inspection is highly suggested. There are many parts to a home plumbing system that must be in constant working order for your water to keep flowing safely and reliably. In the case of home purchases, it’s doubly important to identify potential plumbing problems before the sale closes so they can be addressed completely and everyone can be reassured. 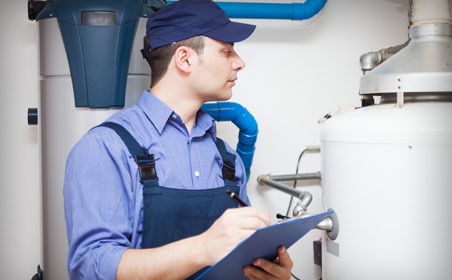 A typical home inspection in Bradford and Barrie will look at every possible aspect of the plumbing at your location. Since lead is a primary concern, your inspector will check the plumbing at your location to determine if lead piping was used. If the inspection turns up lead piping, you’ll be informed about your options for replacement. Your water meter may also be checked for any leaks or other installation errors. Shut-off valves are also inspected and checked to ensure they perform their intended function, which is to keep water from flooding your house in the event of a broken pipe or fixture inside the home. Your hot water heater will also be checked for safety and efficiency, as well as to ensure it is sized appropriately for the number of users in your home. Pipe insulation will also be evaluated to make sure your piping will not be at risk for breakage. Every fixture in the home will also be turned on and inspected for proper water pressure and function. If your home is connected to a septic system instead of a municipal sewer system, it will also be inspected for proper drainage and function. IT’S OUR JOB TO PROVIDE YOU A COMPLETE INSPECTION SO THAT YOU ARE THOROUGHLY EDUCATED ABOUT YOUR HOME’S PLUMBING CONDITION. OUR TEAM IS COMMITTED TO COMPLETE SATISFACTION, AND OUR 100% MONEY-BACK GUARANTEE PROVES IT. CALL M.A.C. STEWART PLUMBING FOR A HOME INSPECTION IN BARRIE OR BRADFORD AND SURROUNDING AREA TODAY AT (705)7335154.